Pelenna Patchworks: New Tribeca Carly fabrics available from Timeless Treasures! New Tribeca Carly fabrics available from Timeless Treasures! 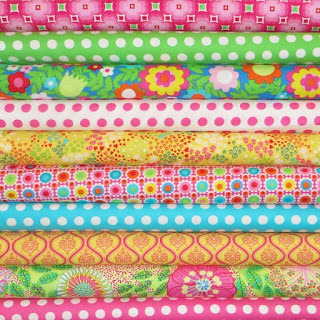 Last of this week's new arrivals is the Carly fabric range by Tribeca at Timeless Treasures. Tribeca is a new division of Timeless Treasures fabric dedicated to producing colourful, playful patchwork fabrics, and the Carly print range does not disappoint! Including drawn and geometric floral prints and bright matching spotty prints, these quilting prints are great for modern, vibrant accessories. We have the whole range available as a stash pack or discounted fat quarter pack, making matching fabrics a doddle! New free cot quilt pattern!